Qualcomm announced the official launch of the Snapdragon 712 mobile processor platform, continuing the many features of the Snapdragon 710 platform, is expected to be more on the performance segmentation of the mobile platform. Snapdragon 712 uses the same 10nm FinFET process as the Snapdragon 710, as well as the eight-core Kryo 360 CPU core and the Adreno 616 GPU. The difference between the two is that the Snapdragon 712 has a clock speed of 2.3 GHz, which is slightly higher than the 2.2 GHz of the Snapdragon 710, which is said to be 10% higher. In addition, another upgrade to the Snapdragon 712 is support for Quick Charge 4+ fast charge, which increases battery capacity from 0% to 50% in 15 minutes. 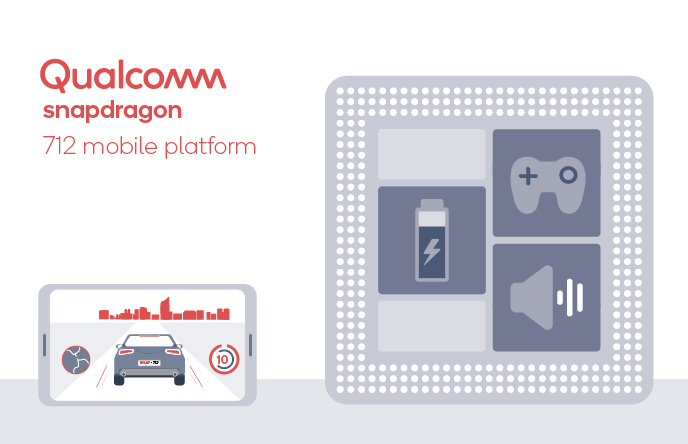 The Snapdragon 712 platform also supports Qualcomm’s TrueWireless Stereo Plus and Broadcast Audio technology to bring Bluetooth audio enhancements. In addition, the Snapdragon 712 integrates the Hexagon 685 DSP (the Snapdragon 710 is the Hexagon 680) and the Spectra 250 ISP. In terms of network, Snapdragon 712 integrates Snapdragon X15 LTE Modem, supports up to 800Mbps download speed, supports 3CA carrier aggregation, 4×4 MIMO and LAA. At present, Qualcomm has not yet announced when a new mobile phone equipped with this platform will arrive.